One day, Chris was home sick and there wasn’t really any food in the house except this pot of soup. So I decided to throw some rice into the leftover soup pot. Surprisingly, it came out well. It was tasty, comforting and quick to make (if you already have this soup). I took the quick route and used cooked rice. You can use uncooked rice but you’ll need A LOT of broth to cook this. Have a great Tuesday! In a small size pot (I used a 1.5 quart pot) combine cooked rice and oxtail soup. Bring the pot to a boil and then drop the temperature to low. Let it simmer for 20-30 minutes. By then, most of the broth will have been absorbed. Stir the porridge and see if the consistency is to your liking. If not, add more broth (Mine was fine with this measurement. Feel free to add more cooked rice or broth if want to make a bigger batch). Stir in some shredded oxtail meat and let it simmer for another 5 minutes. At this point, the porridge is ready. Check for seasoning. Add chopped scallions and cilantro and sprinkle some white pepper. 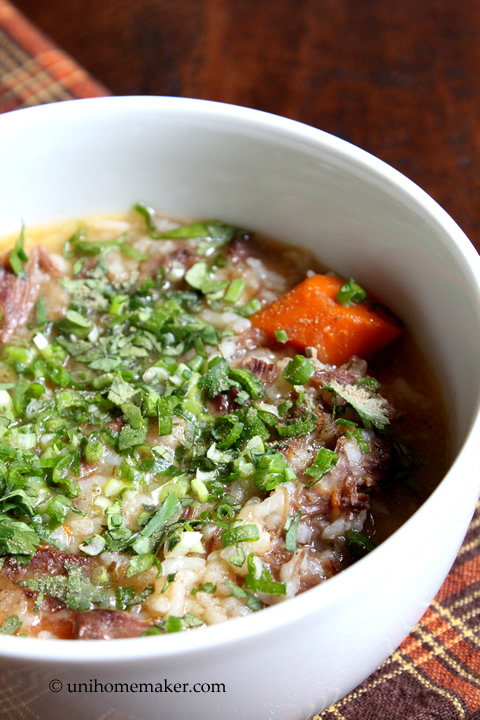 What a great idea to make oxtail congee out of oxtail soup! This looks delicious and perfect on a cold day! Anne, I have so many of your recipes on my list, I hardly know where to begin. What a wonderful looking dish! I’ve never made oxtail soup (thank you for providing the recipe) & I love how you transformed it into something entirely different. Lovely photographs, as always! Mmmm. It looks comforting and delicious. The congee must be very delicious! I’ve never had oxtail soup, but man it looks like I need to try it! Looks like a bowl full of comfort right there! I wish you were around when I was sick! A very good and delicious idea!! I love comfort foods, especially one that make you feel better when you are under the weather. 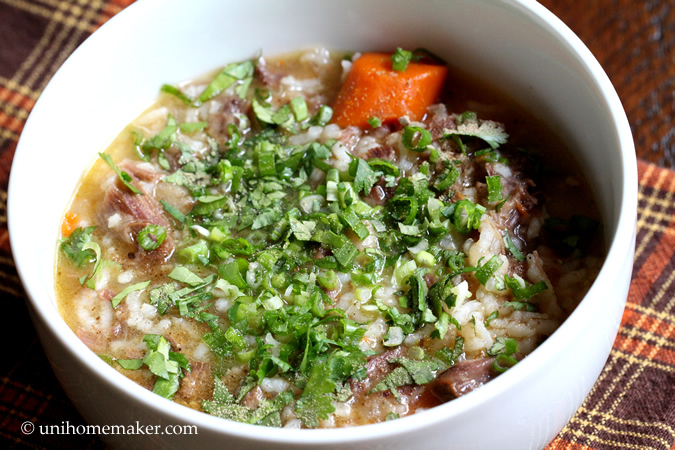 Sad to say I’ve never made oxtail soup, but it’s definitely on my bucket list! 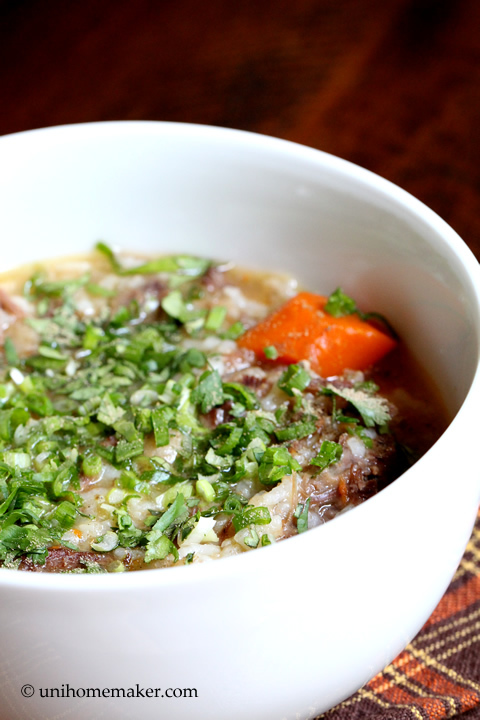 It’s been a while since I had ox tail soup, your congee makes me want some right this moment. I absolutely love the abundant cilantro in here! Oh wow, this looks like the PERFECT soup for when you’re feeling under the weather. It looks and sounds amazing! This is really interesting, never thought of making oxtail porridge. This looks really good to have when the weather turns cool! Ah-mazing, Anne! Such a creative spin on a comfort and healing dish. So perfect for this time of year. Thank you for sharing! I did the exact same thing for my hubby when he was so badly sick last month. Leftover soup with rice is the best cheat. This is a great use of leftover rice! This looks like a wonderful bowl of soup, Anne, and perfect for the ever-cooler temps coming our way. I can almost feel the steam rising from my bowl. Mmmm. I absolutely love a good bowl of congee, and this looks just right. I wish I could reach out and have some! Hope Chris is better! so neat to use soup to make flavorful ginger! Our father loves oxtail. I am going to forward him this recipe. This is such a comforting and easy dish, Anne! Absolutely delicious and warming for those brisk fall nights. Thanks for sharing! I’ve had oxtail soup, but never oxtail congee. Looks wonderful! And very creative – love the idea. Thanks. Before I met Anne I’ve never eaten oxtail soup *or* congee before. Now I’m trying to make up for lost time! Sounds like the epitome of comfort food! Perfect with the arctic chill headed our way! 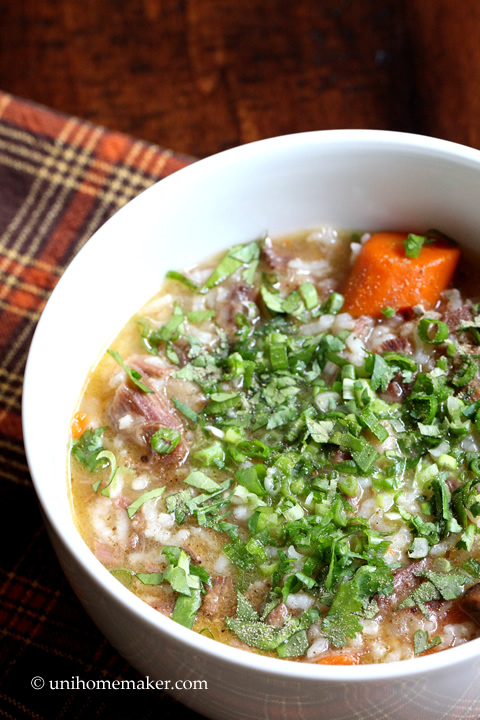 I’ve actually never had oxtail soup … but it sure does sound delicious! Anything warm and comforting I am all about these days .. it’s getting so chilly!! Have a great night Anne!! Your soup looks so soothing and warming. No wonder you use it for “get well food”! I make a similar soup with chicken for the same purpose. 🙂 Beef is probably hardier. I never had this soup before! Love how you transformed it! It sounds like the perfect cure for whatever ails you – so hearty and comforting! Yum! This is my sort of food Anne. I could demolish a big bowl of this right now. 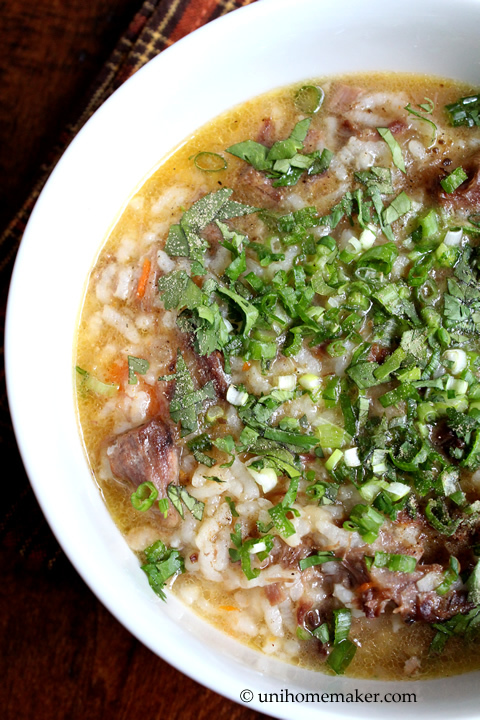 i never made a congee with oxtail before, what a great idea….